Up to four to six months, your baby only needs breastmilk or formula to grow and thrive. When she’s ready for solids, she will tell you! Can she sit with support and hold her head up steady? Does she mouth her hands and toys? Does she look interested in what you’re eating? If your answers to the above questions are “yes,” and your pediatrician gives you the go-ahead, you can start introducing solids. How fun! Before you even start, you may want to enroll in an infant CPR class if you haven’t already taken one. That will make your baby’s adventures into food all the more safe. The first food is often rice cereal, but more parents today are opting for more nutritionally rich brown rice, oatmeal or barley. Some caregivers will even offer avocado or meat as a first food. The most important thing to remember in the first year is to always breastfeed or offer formula before giving solids because breastmilk or formula is the most important source of nutrition. You may want to breastfeed or give your baby a bottle and then wait a half hour before offering the solid food. Mix 1 tablespoon of a single-grain, iron-fortified baby cereal with 3-4 tablespoons of breast milk or formula. Soupier consistencies might be easier for baby to swallow, but they will also be messier, so grab a bib or three! Try a plastic bib with a pocket for easy cleanup. Resist the temptation to give cereal via a bottle. During the first year, food is for fun, and she won’t learn good eating habits without the chance to practice. It is important to introduce new foods one at a time, every three days, so you can easily identify any adverse reactions to each food. Look for rashes, vomiting, or diarrhea in the cases of food allergies. Once baby has accepted the food without a problem, you may give another food. If you have been breastfeeding, your baby has already been given a taste of all the spices you are eating as a family. You can eventually give baby spices as well, following the one-new-food-per-three-days rule. Try adding cinnamon or nutmeg to apples and sweet potatoes. Before a year, stay away from honey, which might contain dangerous spores that cause infant botulism, and don’t substitute cow’s milk for breastmilk or formula because it doesn’t fulfill your baby’s nutritional needs. 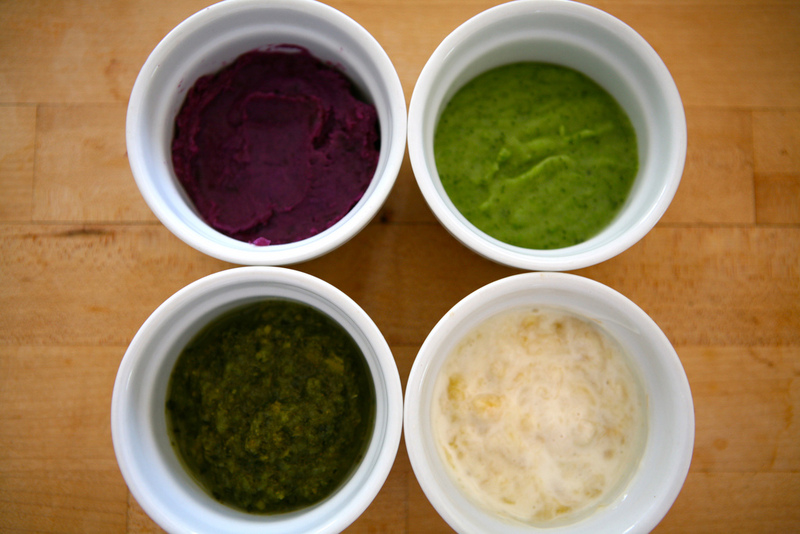 When making your own baby food, make sure you use only organic root vegetables, and wash all produce thoroughly. Freezing small portions in a covered ice cube tray will give you the perfect portions for baby! By eight to ten months, your little pumpkin will be ready for finely chopped finger foods like fruits, soft cheese and pasta. Mash up whatever the family is eating for dinner and let baby share in the meal! To prevent choking, stick to foods that are soft or break apart easy. Hot dogs, cheese, larger chunks of meat, candy, grapes and nuts can be dangerous for tots. To make solids a smoother experience for both of you, feed baby only in a high chair or infant seat. Toss down a drop cloth to catch tossed tidbits – and try to let her explore her food with her hands without getting worried about a mess. She is learning! Offer a spoon once baby starts mastering finger foods, and begin to offer a cup at about 6-8 months to help her get used to drinking from a sippy. Last, when you baby turns away at a food or seems uninterested, don’t try to push it. Her bottles or breastmilk gives her the nutrition she needs and trying to force one last bite is a power struggle no one will win. Have fun with this new adventure in parenthood, and we hope to see you in our infant safety classes and child development classes.